All Web addresses mentioned were functional as of 4-7-17. From the Cumberland Gap to the Atlantic Ocean, this is Virginia Water Radio for the week of April 10, 2017. That’s the sound of water flowing in the South Fork Roanoke River in Montgomery County, Va. If you were under that flow on a rock, stick, leaf, or sediment on the stream bottom, who, or what, might be your neighbors? This week, a group of Virginia high school students gives us a quick lesson on that subject. Have a listen for about 20 seconds. Males: Black fly! Crane fly! Midge! Females: Riffle beetle! Water Penny! Hellgrammite! You’ve been listening to the names of 13 kinds of aquatic organisms found in streams, lakes, or other freshwater habitats. The names were shouted out by students from Patrick County High School, located in Stuart, Virginia, during a visit to Virginia Tech on March 31, 2017. Collectively, the organisms are called macroinvertebrates: “macro” because they’re large enough to be seen without a microscope; and “invertebrates” because they don’t have an internal backbone. Over 11,000 species of macroinvertebrates are known to inhabit freshwaters in North America, and many more species are found in marine waters. Some, like freshwater snails, are aquatic for their entire life cycle; others, like many aquatic insects, emerge from water as adults. Aquatic macroinvertebrates are important components of biological communities, the term for interacting populations of different species within a given area and time. Within those communities, macroinvertebrates have various ecological roles, such as, as predators, like dragonflies; prey for fish, like many mayflies; consumers of algae off surfaces, like many snails; collectors of floating organic debris, like blackflies; or parasites, like some water mites. They also have various requirements or tolerances for different physical and chemical factors, such as temperature, the level of dissolved oxygen, and the level of pollutants. This, along with relatively limited movement, makes macroinvertebrates valuable for biological assessments of water quality and aquatic habitat. For example, freshwater Virginia streams without significant pollutants or other impairments typically have a diverse biological community, with many different kinds of macroinvertebrates. In contrast, a stream with poor physical or chemical conditions will tend to have less diversity and may be dominated by the more tolerant kinds of organisms. Thanks to Patrick County High School students and the school’s Dan River Basin Association Club for lending their voices and energy to this episode. 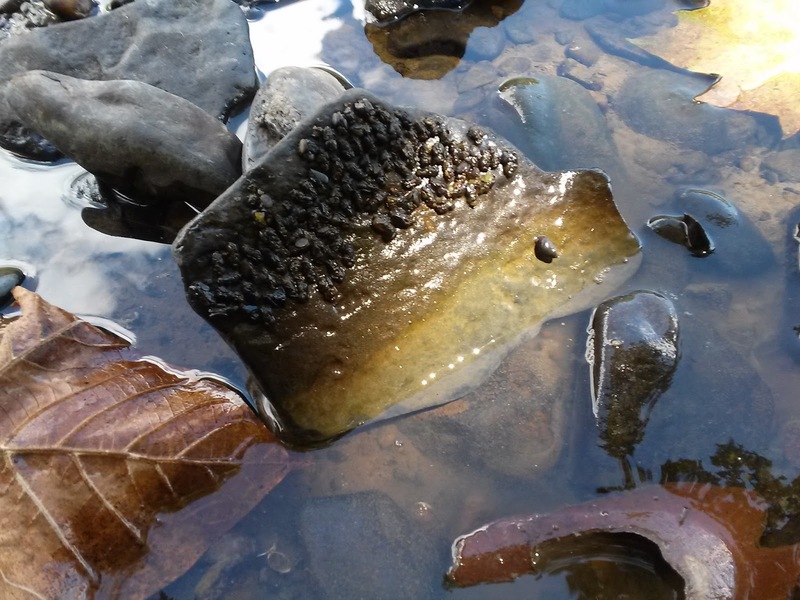 As those students did at Virginia Tech, bring your curiosity and observation powers next time you visit a stream or other water body, and you just might have a biological community meeting with...[GUEST VOICES] aquatic macroinvertebrates! Thanks to Liz Sharp, Tony Timpano, and Eryn Turney, all of the Virginia Tech College of Natural Resources and Environment, for their help with this episode. Special note: Careful listeners may have heard a bird in the background near the end of this episode. That was a Tufted Titmouse, calling outside the window during the recording of this episode at Cheatham Hall on the Virginia Tech campus in Blacksburg. It doesn’t have anything to do with aquatic macroinvertebrates, but it sounded nice, so it stayed! Dragonfly perched above a pond on the grounds of Eyre Hall near Cheriton, Va., (Northampton County), October 6, 2007. Stoneflies collected from the South Fork Roanoke River near Elliston, va. (Montgomery County), September 24, 2009. Caddisfly cases on a cobble in the New River near Eggleston, Va., (Giles County), August 31, 2014. 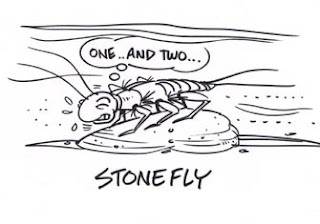 Below are three cartoons about aquatic macroinvertebrates, which illustrate some behaviors seen in three important groups: mayflies, stoneflies, and caddisflies. The illustrations are by George Wills of Blacksburg, Va. (http://www.etsy.com/people/BlacksburgArt). The source of the illustrations and the accompanying information is “Bottom-dwellers Tell Stories about the Water Above," written by Sarah Engel for Virginia Water Central, April-June 2002 (Virginia Water Resources Research Center newsletter), available online at online at https://vtechworks.lib.vt.edu/handle/10919/49327. 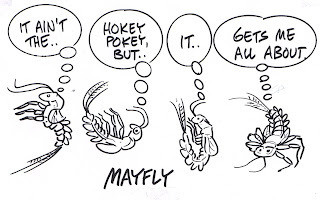 If water flow or the level of dissolved oxygen in water, some mayflies may use movements to increase the pass of water across the gills on their abdomen (posterior body section), where oxygen is absorbed from the water. 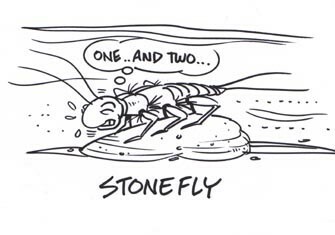 As a group, stoneflies are particularly sensitive to the level of dissolved. In response to low dissolved oxygen, some stoneflies will use “push-ups” to increase movement of water across the gills on their thorax (middle body section). 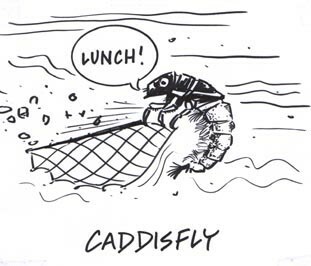 Many kinds of caddisflies are known build various kinds of cases from leavers, stones, or other materials, held together by a silk-like material that the insects produce. But net-spinner caddisflies (the family known as Hydropsychidae) don’t live in cases; instead, they use silk-like material to produce nets with which they filter food out of passing water. Michael T. Barbour et al., Rapid Bioassessment Protocols for Use in Wadeable Streams and Rivers (Second Edition), EPA 841-B-99-002, July 1999. Oxford Dictionary and Thesaurus (American Edition), Oxford University Press, New York, 1996. R. G. Wetzel, Limnology—Lake and River Ecosystems (Third Edition), Academic Press, San Diego, Calif., 2001. Alan Raflo, David Gaines, and Eric Day, “Mosquitoes and Water,” Virginia Water Central, June 2009, pages 6-15, Virginia Water Resources Research Center, Blacksburg, online at http://vtechworks.lib.vt.edu/handle/10919/49357. A previous episode on stream assessment with aquatic macroinvertebrates is Episode 81, 9/26/11. Episode 268, 6/1/15 – on chironomids (non-biting midges). 3.10- impacts on survival of species.